Sheri’s take: There’s strength in numbers, especially in having a number of well-informed alliances to supplement our own financial know-how. Mark Maurer, CFP®, MBA, president and CEO of LLIS is one such alliance we’ve long maintained – because protecting the wealth you’ve already got against life’s many risks is essential to your total wealth interests. Thanks to Mark and his LLIS team for sharing this guest commentary on insurance coverage worth considering during the fast-approaching fall open enrollment periods. For 2018 healthcare coverage, that’s Nov. 1 – Dec. 15, 2017. For Medicare, it’s Oct. 15 – Dec. 7. 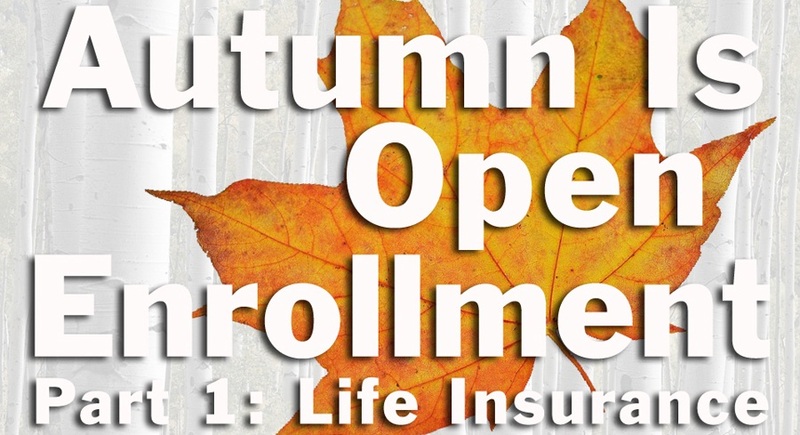 Other enrollment windows vary but, just as we use Daylight Savings Time as a prompt to change our smoke alarm batteries, fall open enrollment season is an excellent time to review your wider insurance needs, including group and individual life and disability insurance. As always, if this commentary generates questions about your own circumstances, please be in touch with us for a personalized conversation. Dying is expensive. The average funeral costs $6,000-11,000. Tampa (home to LLIS) is at the lower end; New York City is at the higher end. Cremation services average $3,000-4,000. And that doesn’t account for end-of-life expenses, which are typically highest in the last six months of life: about $18,500. It may take time to get insurance in place so it’s best if you don’t put off weighing your options until you imminently need them. If you’re going with group coverage during open enrollment and you don’t name your beneficiary(ies) in time, the law will determine who receives insurance proceeds in case of death. 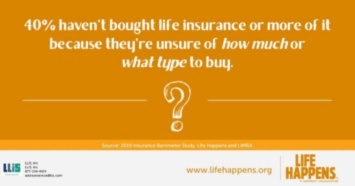 Group life insurance can be one of the most valuable benefits your employer may offer. It’s not uncommon to find offers of $500,000 in coverage for the monthly cost of one barista-prepared coffee confection. And sometimes your employer will even provide it for free. 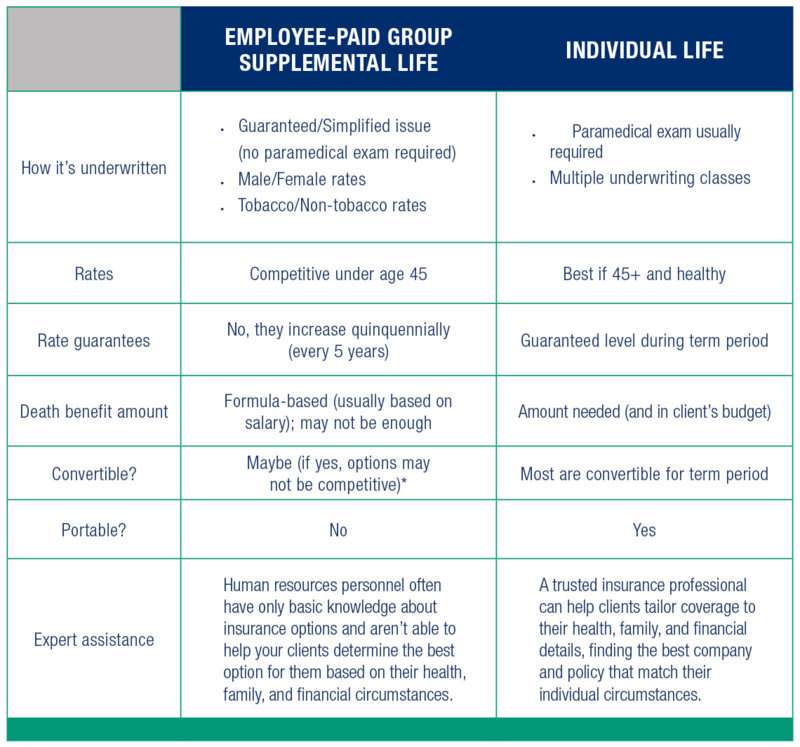 While you’re considering any group options available, it’s also a good time to consider individual life insurance to supplement or replace employer-paid insurance. 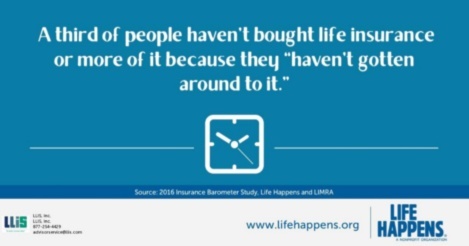 (In fact, according to the American Council of Life Insurers, only 44% of all life insurance policies in 2015 were through groups, which included employers, places of worship, and other associations). Are you considering coverage for retirement years? Remember, upon retirement, you’ll probably lose your employer-provided life insurance. You may be able to convert your group policy to an individual one, but it may cost significantly more. Does the group coverage actually cover your needs? Here’s our condensed death benefit calculator to help you and your financial advisor estimate your needs. Are you considering a career change or switching employers? Again, group coverage is tied to your job; it may or may not cost-effectively transfer to an individual policy. Are you searching for a basic policy? Group offerings are usually quite limited. If you want more choice and a policy tailored to your individual needs, a group policy might not fit the bill. Do you have a large family? An individual policy supplemented with employer-paid coverage may be your best bet. How old are you? 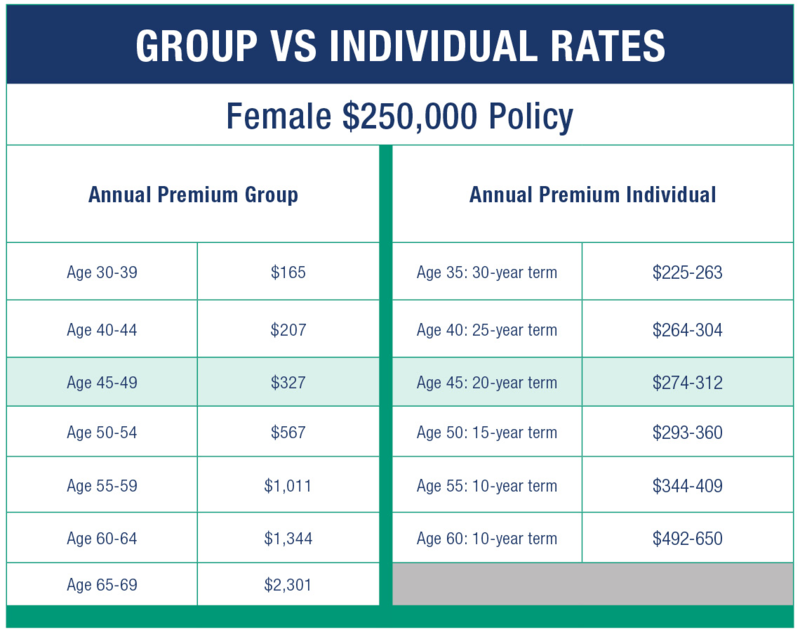 The cost of life insurance rises as we age, and group rates can be substantially higher than individual rates at certain points. Clearly, there’s lots to think about with respect to your life insurance, so I’ll save the conversation on disability coverage for my next post. Since your ability to earn a living is often your greatest asset, protecting against disability is essential for most families, so be sure to come back next week for a look at the key considerations there. 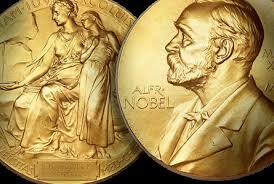 SAGE Serendipity: The Nobel Prizes are being awarded this week. The Prize in Physiology or Medicine went to Jeffrey C. Hall, Michael Rosbash, and Michael W. Young for their discovery of “molecular mechanisms controlling the circadian rhythm“. “The biological clock is involved in many aspects of our complex physiology. Their discoveries explain how plants, animals and humans adapt their biological rhythm so that it is synchronized with the Earth’s revolutions.” When he was interviewed Jeffrey C. Hall praised the role of the humble fruit fly, “the key fourth awardee here is … the little fly”.